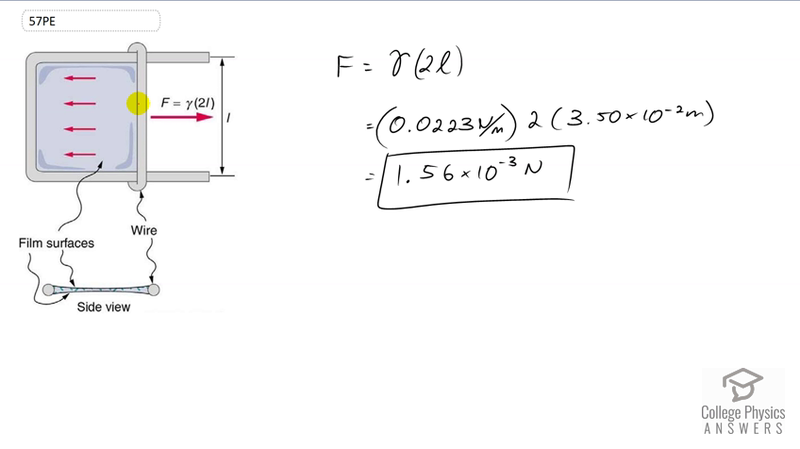 Calculate the force on the slide wire in Figure 11.32 if it is 3.50 cm long and the fluid is ethyl alcohol. Figure 11.32. A sliding wire device for measuring the surface tension of a liquid. There is a front and back surface of the liquid, which is why the factor 2 appears in the equation for force. This is College Physics Answers with Shaun Dychko. This wire is being pulled by some force that we have to calculate here and the surface tension in this fluid is pulling back. There are two surfaces with surface tension. There is the one that we can see facing us, and then there is one on the backside of it as well. So that's why we're multiplying by two here. So the force is going to be the surface tension of the liquid which is ethyl alcohol in this case, times two times its length. So that's 0.0223 Newtons per meter surface tension for ethyl alcohol, times two times three and a half centimeters which is times ten to the minus two meters, giving us a force of 1.56 times ten to the minus three Newtons needed to balance the surface tension force.